These names signify that these cords are coiled, curly and retractable. 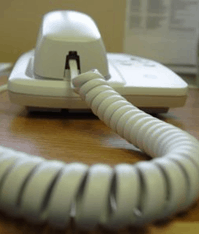 An example of a common use is the modern telephone: curly cords are what attach handsets to telephones. Curly cords tend to be designed differently to fit their various uses. Obviously, the work that goes into making curly cords for key chains differs greatly from the work that goes into creating curly cords for heart defibrillator paddles. Curly cords used for medical devices fit into the first category. “Since medical devices have to be cycled many times and absolutely cannot fail,” Kinzalow points out, “they are constructed differently so that they can be extended and retracted hundreds of thousands of times and still maintain their structural integrity.” Therefore, the process for creating stationary curly cords differs greatly from the process for creating the more durable curly cords. Kinzalow explains the second type, “stationary curly cords are those that are created to stretch only once – like when someone has two devices, and one is always in a fixed position while the other’s position can vary from a foot to five feet away. These curly cords are not designed to go back and forth, they just always stay plugged into a stationary device and can stretch to connect to the other device, whether it is one foot, three feet or five feet away.” These types of curly cords would be designed to accommodate their relatively stationary purpose. According to Kinzalow, if you are an Original Equipment Manufacturer looking for durable curly cords, there are several things you should take into consideration before you place your order from a vendor like Meridian Cable. First, note in what kind of environment you would be using the cords. Different environments call for different designs: curly cords made for industrial environments differ from those made for medical environments or retail environments. Next, you must decide how long of a life you need your curly cords to have, and how dynamic their lives will be. For example, if you need curly cords that must last a hundred thousand cycles, than you must ensure that your design is catered specifically to these parameters. Or, if your curly cords need to last forever and be cycled 30 times a day, you must ensure your vendor is able to specially design them. For example, there are some curly cords that must endure 500 movements a day for one month (so, 15,000 cycles total). These are those curly cords that are popular in retail environments for merchandise protection; they are the cords that are attached to the hot, new items, like IPods, so that someone cannot just walk off with them.” Anyone who has gone anywhere near an Apple store during the month of December has witnessed these theft-preventing curly cords going through thousands of cycles. Stores like Apple’s allow you to test out the hottest new items without taking the risk that you will leave with them – all thanks to curly cords. Whether you need curly cords or other types of specially designed cables, Meridian Cable (www.meridiancable.com) is the certified cable and wire assembly vendor that can meet your needs. Call us at 1-866-866-0544 to talk to our engineers today!